Coming soon fully Gutenberg ready! We have been working on GDv2 for a few months and it’s time to share a few of the details and goals, so users and developers can plan for the future. 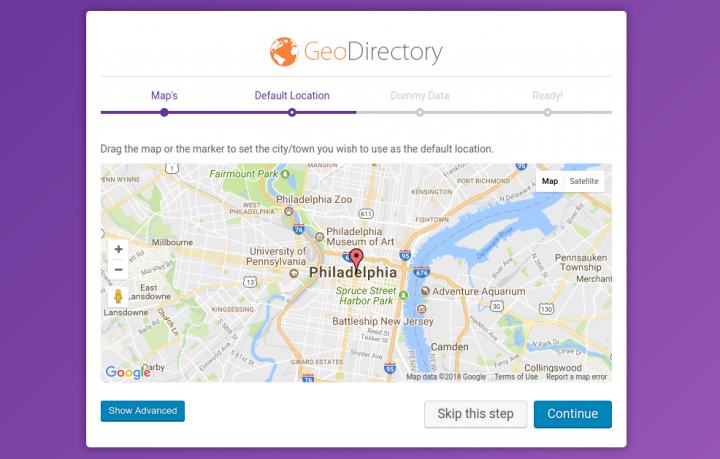 GeoDirectory V2 delivers Simplicity, Theme Compatibility, and a Modernized Codebase that take advantage of newer versions of WordPress and PHP. GeoDirectory users have created directories for every niche, and our users come from everywhere and from every skill level. We have senior level developers supporting hundreds of GeoDirectory sites for large companies, junior developers using GeoDirectory for client projects, and WordPress beginners who are creating a directoy for their home town as their very first site. GeoDirectory V2 features a new Setup wizard that is simple and effective; be up and running in just a few seconds without missing any of the essential settings (like playing with background colors 🙂 ). GeoDirectory V2 features a completely rebuilt settings area brings the main settings up front in an easy to use interface, while still providing easy access to the advanced settings and options that our users love. GeoDirectory V2 further improves usability for site managers by taking full advantage of the WordPress menu system. All the benefits of advanced links created by GeoDirectory now available in the familiar WordPress menu management interface. GeoDirectory V2 is 100% compatible with any modern theme, right out the box. Our members have spoken! Themes come in all shapes and sizes; GeoDirectory V2 comes with a whole new layout functionality that will enable you to fit your directory to your niche using your theme. 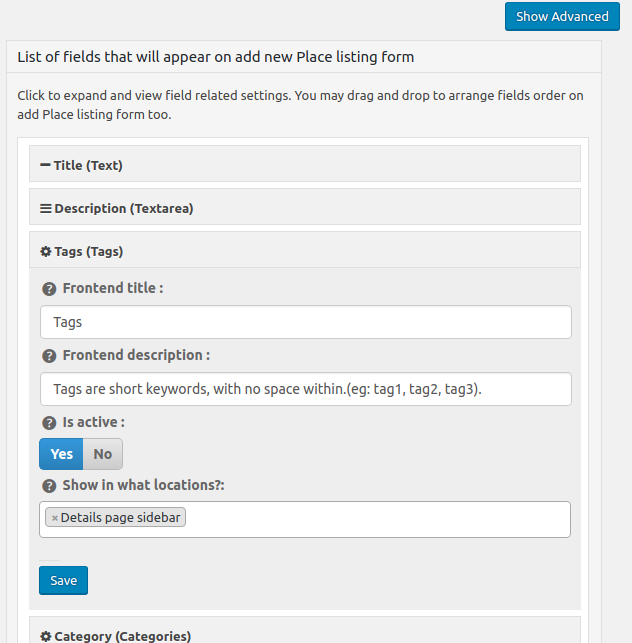 GeoDirectory V2 includes new options that enable you to take advantage of page builders such as WordPress’s upcoming Gutenberg! After Gutenberg’s release GeoDirectory V2 will include blocks giving you unprecedented freedom for your layout. The changes aren’t just limited to the content area, either. GDv2 allows you to move blocks between the content area, sidebars and even widget areas. 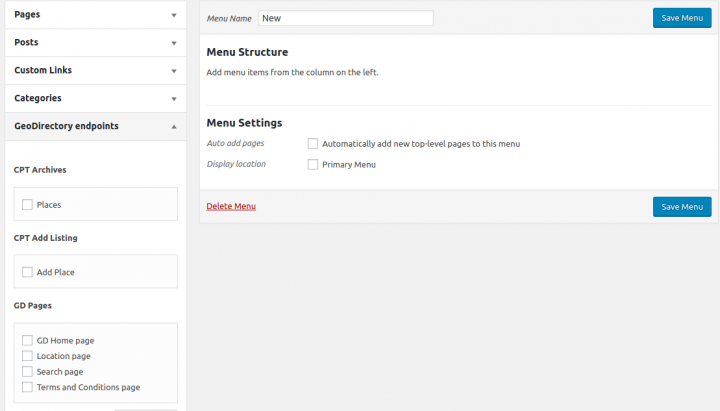 New options enable you to decide exactly which pages display which blocks, too. With GeoDirectory V2 you can make exciting new layout designs using even more GeoDirectory block elements than ever before, and do it all with any theme! GeoDirectory V1 was written for an older version of WordPress and PHP. GeoDirectory V2 is modernized and streamlined in both the core and with regard to dependant resources. These improvements touch all the features and functionality making for performance improvements across the board. GeoDirectory V2 takes advantage of opportunities for gains with PHP and in WordPress for current and future features like Gutenberg! Simplicity and Compatibility without compromising on features or speed! GeoDirectory V2 setup is a breeze for any skill level. GeoDirectory V2 continues the tradition of the most feature-rich and scale ready plugin for directories, whether it is the centerpice of the site or part of a larger whole. 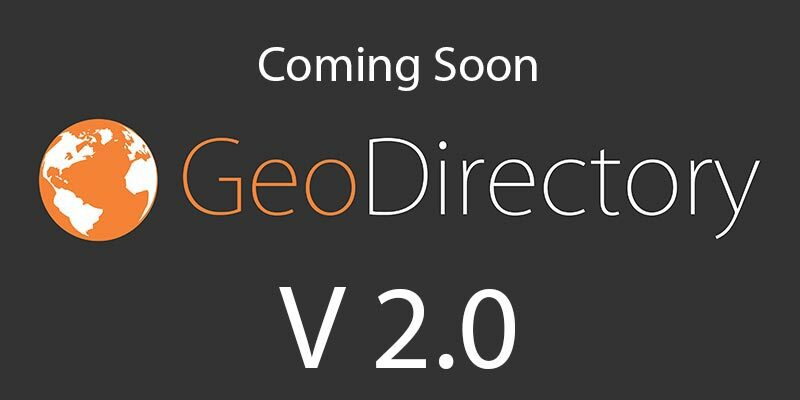 Work on GeoDirectory V2 continues; the foundation for GDv2 is complete and now we are working hard to make all the features you know and love work as good or better than ever before. Look out for more posts about specific improvements and features during our countdown to the beta. There are just too many improvements for a single post! Is the blog post still going to come today` (Wed) or am I overseeing it somehow? Sorry, I cannot see an official lauch date. Do you have one please? It seems to me from hours of reading through the forums, there is promises of things to come, but they have not yet eventuated. I wonder, how long, we are meant to postpone development on our own sites, to wait for the promised release? Just a straight up EAT IT date please? PS. You probably should have just kept quiet about the “open hours” plugin being replaced by your next update, which would have course lead an addon developer to abandon ship. I refer to a comment by Paolo on 28th of August 2017. That is 180 odd days ago, which is pretty big in any web developers book. Well Open hours, probably shluld have been included in the core, a critical function of just about all the scenarios IRL. But that is ok, Geo does many the others don’t, in terms of the way it works. I think the worst part about Geo is the silly Private comment solutions. You know, the one where you go “Great, this guy just asked the exact same question I had” and the answer is in secret! Hmmm I thiought that’s why we paid for GPL software, for the support. I mean, when I jump on a new theme or plugin a maximum of half a day is usually wasted before I am DONE banging my head against a wall, flick the thing and go back to square one. No probs, a hundred or two down, lesson learnt, no more time wased. My head is really bloody sore after 180 days. Patience is a premium price. Make me EAT IT. Show me the most awsome plugin I have ever seen. Actually, just release something. 1. Firstly on ETA, i will be doing a blog post about it later today so i won’t get into details here but we have been doing some interesting things with Gutenberg compatibility which were best to do now rather than after v2 launch. 2. The opening hours things is complicated, we never had our own at first and then a 3rd party dev built one so we never needed to, but support and compatibility issues that we were hoping would be resolved never were so we did flip back and forth about our decision to build our own, but its now built and is awesome! 3. Private comments are only used for private info, i only ever mark my answers private if they contain user links and the user has specified they with to keep the site link private. 4. I hear ya about wasted time on new themes/plugins, ease of use is a huge part of GDv2, actually one of its main goals. Keep an eye out for my blog post later, i think you will like it. Thank you that would very much appreciated – timing details would be obviously most important for everyone as I’m sure many others are also currently just waiting idly and cant plan ahead. I will be doing a blog post later today, sharing some new features and our road map. A newcomer’s request – Following some key points made in “The 6 rules to monetize a directory website” article & replies (Start by adding listings yourself — Start with free listings. — Sell premium listings allowing extra features compared to free listings. — Giving away few free featured listings to market leaders can also be a good idea… all great advice! ), here’s my request… I’d like it to be easier in V2 to offer three noticeably different levels of ad packages (Free, Basic & Premium), with varying degrees of features. Not every business will want to pay for Premium ad listing with all of the “bells and whistles”, so I’d like to also offer a basic (mid-level) ad listing. Right now “Featured” (Premium) listings are at the top of a category listing page. Please allow a way for the mid-level (Basic) listings to fall in the middle of a category listing page, between the Premium and Free listings. On a category listing page, allow a noticeable decrease in the prominence of the listings, as a visitor moved down the page from the Premium group to the Basic group to the Free group. I.e. : Allow different size image for the Premium (larger image), Basic (mid-size image) & Free (small image) listings. This will not change in V2. I feel almost sorry for asking because I know you’re working hard to get it done asap and you mentioned that you will revert an ETA if available, but this is the last week of Feb and I’m nervously wondering if there will be still a core beta as in Feb as announced or if it will fall into March? To be honest any kind of timing update would be tremendously helpful (even just in terms of a week). I really hope you could shed some light into it! We are not too far, but we’ll definitely miss the Feb deadline. Stiofan will do a blog post tomorrow about it with more details. One of my big stumbling blocks in moving forward with GeoDirectory is the requirement that every entry have a physical address. The directory I’m working on has a lot of virtual workers (consultants, home care providers) who don’t have an address other than their home, which they may not want to share publicly. Is there any chance the new version will allow me to mix companies that have an address with providers that don’t have one in the same directory? For anyone who don’t want to have a published address, you should enter just the city name in the address field and assign them to a category with a transparent map pin. Otherwise we don’t know where to make them appear. We can’t have listings without address that appear everywhere, that would make the directory a bit sloppy IMO. I’ll join the questions above on ETA. Just a confirmation of the week would be already extremely helpful for everyone to plan ahead. We are still working on it, we’ll give an ETA when we have an ETA. which, to my surprise, has been launched recently in direct competition to my GD project that I have been willing to be able to have also as an app since I started more than two years ago. By the way, I wonder also how this app has been built. Do you think that it is possible to to do it with resources like AppPress, AppPress or PhoneGap? Gd Apps will be finished after we release V2. Yes you could probably do something similar with PhoneGap or similar. Will there be a way to publish local blog posts/news for different locations in the new version? This is something I’ve seen people asking for earlier also. In some ways I think it’s pretty strange that a Geo Theme didn’t implement the Geo functions for the base function of WP (Blog posts). Maybe if it’s possible to easily design and use the custom post types the solution maybe is to just create a CPT instead and use for local news? That’s exactly what you can do with the custom post type add-on and what we’ve been suggesting to do since we created it. Quick Question, Will you include support for TwitterCard Tags and Facebook Tags with the new version. At the moment you have to use a plug in like Yoast for them, but if you use Yoast the Meta & Title Tags arn’t quite right on the Geodirectory pages, so to fix those you have to Tick the Disable overwrite by Yoast SEO titles & metas on GD pages options and use the settings in the gd options but then by doing that its then doesn’t output the twitter and facebook tags that yoast adds. So bit of a catch 22 with you being face with having to chose between having correct title tags but not OG tags or having OG tags but incorrect title tags. I see the problem you have, i am just finishing up reviews and then i’m moving on to titles and meta settings, i will be sure to make it work either way. It will be possible to upload pictures from Wp library? No it will not, that would be an enormous step back performance wise. The database would go out of control. If you want to know why, we explained it several times in forum’s topics. A quick search should bring them up. We have a very similar situation as maba11, since we have some customizations we are now on pause until v2 arrives. Really looking forward to the upcoming version and can´t wait to start working again! I hate to ask this but do you have a realistic ETA? Do we have a estimate release date? We were just on the way to launch in 3 weeks, but now we don’t want to waste more time and more budget until v2 is released (we were customizing since September 2017). Do you know when in Feb the v2 will release? I think listingpro is also coming out with a release in Feb (have purchased both, but not installed either yet). Curious about the timing. Will the ad management function be included in v2? I’m a member, how do I obtain the announcement of the v2 release? How long after v2 will the templates be released so we can use in new installation? Another thought, is it worth you guys doing a survey to find out just what type of themes people may be wanting. Easy to do and no harm in doing that. That is fantastic news that you guys will be developing your own themes. I’m very much looking forward to them. News about the App Solution? That will be out priority after v2 full release. I have to say that I’m curious how V2 will look like. I have now bought 4 listing themes and three listing plugins, I have to admit that I am very unhappy with my decision. Yesterday I read her post https://wpgeodirectory.com/best-wordpress-directory-theme/ unfortunately 2 months and $ 300 too late. I’m surprised, I’m very interested in a modern design such as ListingPro by Cridio Studio. By the way, that too bought. I am very excited. As a non-member screenshots are shown that you can get an impression. Thanks Stiofan. You were very kind in your reply. Also when you say v1 customisation might not work in v2, would you expect that customisations that dont work would have to be redone or would they just require slight amendments? I’m basically trying to figure out whether it makes sense to get someone working on customisations to not waste time until v2 is released or whether it’s just throwing money away as they have done redone for v2. So much of the code is changing that likely there would be issues, it depends on the customsation but at this point i would recommend building your content rather than customisations. Thanks Stefan, so just to be clear, the actual release of the V2 beta will be in February (i.e. not only an announcement when in 2018 there may be a release)? Given that you said that customisations may no longer work, I will have to wait now until V2 is released. The first core beta will be released at some point in February, after that there will be a beta released ever week until its ready for full release. A question or suggestion for you guys. Please know that I am ignorant of all things ‘code’, so that allows me to be bold in asking stupid questions. Right! Is this something that Geodirectory already does, and/or will it be included in V2? I’m not sure how the related tags would work from a developers point of view but here is an example of how we would want to cross reference tags from different areas of our website. “Related Businesses” and “Related Blog Posts” etc. And be able to draw from the same tags across different sections of the website. I was referring to any of the themes that GD offers. For example, the “whoop” theme on the homepage could you have a badge or selection available labeled “blog”. Then your users could see what new content that your writing about. I know there is a “talk” option but in addition to that… one that says “blog”. Re timing of release: will there be just an announcement in February when the beta will be released or will the beta be actually already released in February? I’m considering to outstource several items to a developer but naturally I dont want to waste money as a result of the customisation not working anymore with V2. I’m in a tricky situation as I wanted the design & functionality to be finished by end of Feb.. I can’t comment specifically on your site but in general i would say, adding content will be fine, but v1 customizations might not work with v2. Would it be easy to link blog tags with geodirectory tags so we can interlink posts and places? Maybe it works like that already but I haven’t been able to get it to link up. I have been thinking about something like that (not implemented yet, i am all ears if you have a suggestion on how it should work. Is it not possible to use the tags same tags that are used for normal posts across everything. So you have just one set of tags. thanks for the feedback! However tags can only be the taxonomy of 1 custom post type. So that’s unfortunately not possible for how WordPress works. 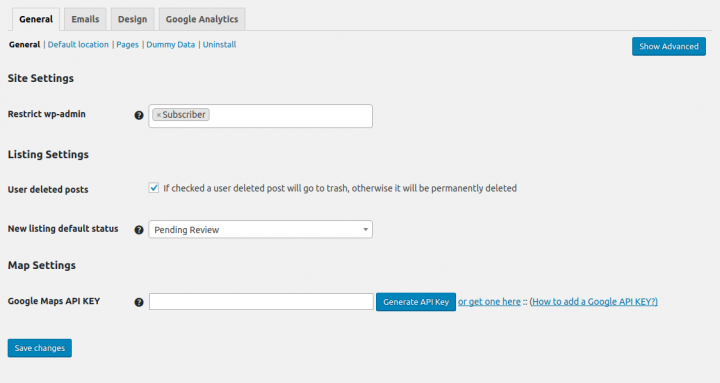 Question… The current GD plugin… Does it offer a Blog feature? And will the new V2 have one? WordPress in general is mostly used for blogging, is there a specific feature you mean? Hi, you are doing a great work, thanks! I’m very glad “V2 will include improved business hours module” and I’d also like to contribute to an improvement to this module, what would be the best way to do it? I’d need to input business hours weeks or even months in advance (for activities doing open hours changing within a month or even a week) and I thought, why not making it available for all users hitting two birds with one stone? Can you suggest me the best way do accomplish this? Paying a developer to help you or directly you maybe? I replied to your email, thanks! Great news on the update. Will it be possible to use the gd location features on posts as well as cpt? Running a big site, and need the directory features but without converting 1000 trails to geodirectory custom posts as we’re image rich and don’t want to use the geodirectory image management. If we could create a cpt and manage images with media library, that might work too! Also, will you be able to show any custom post type near the current one as this is a deal breaking functionality for us. The plugin is working brilliantly on a few smaller sites, and we’d love to use it on our main one. 1. An easier way for the admin (on the back end) and the business owner (on the front end) to duplicate a listing. I have several businesses that are franchises and the only thing that needs to be changed are the hours and address. It would be great to click a box and duplicate a listing. You’r in Orange, the background must be Orange too, not Purple. I tried our orange but it did not look good at that scale. Really looking forward to V2. Don’t sleep or eat, just work through and get it UP and OUT ASAP. Appreciating the team’s hard work. I’m really glad to hear about this. But…what happened to the business hours module? As we’re all aware of, Jeff pretty much abandoned his business hours and special offers plugin. Business hours that are easily edited and readable are important for a directory. V2 will include improved business hours module. I purchased the entire package at the pre-Christmas deal. Will I be entitled to receive this upgrade? We will and hopefully with GD V2 being simpler to integrate, other theme designer will too. Thanks! On one hand this sounds exciting. On the other, I just took a look at Gutenberg following your link at the top of this page – that plugin has A LOT of negative feedback. I am worried that current GD sites will have a difficult time (spending LOTS of time getting their site working) when this comes in! I’ll be brutally honest with you. IMHO people complaining about Gutenberg are people scared about changed or small developers that are afraid of the extra workload that Gutenberg will bring to them. Most people that are contributing to the project meaningfully are excited about Gutenberg (like us). When WordPress introduced Custom Post Types, people were complaining too. I am about to launch a new site using the existing GeoDirectory. Would it be wiser to wait for the release of this update? Or will I find transitioning over easy whenever it happens? I presume existing subscribers can benefit from an upgrade at no further cost? I wuold launch it when V2 is released in its final version I’d work in a staging site to convert and than push the new version online. Yes existing members will get it as a regular update. Agh, wrote a long comment… didn’t put in email… deleted. Thanks for a good product, simpler is better, keep working on documentation. Looking forward to the upgrade! Especially the listing wizard, I think that will make the UX far superior in itself. Congrats guys – very exciting! That sounds really amazing. – Especially the higher flexibility offering improved design options, but also the better advertising options. As I am not happy with the design opportunities of V 1, I am still testing on a local installation working on the layout and implementation in a template. – Changing some PHP in the template and in GD. I originally planned to go online in spring, but I am not in a hurry. This means, that a delay of up to three month would not be a big issue. What’s your advice: Skip the current setup because the transformation could be complicated? However, something more trivial: Will it be available for subscribers of V 1. automatically, or is a new subscription necessary? Did I miss an official release date? It will be available to all members automatically… As far as holding oir continuing I guess that’s really up to you to decide. The database structure will not be changed. Will it be opening hours with ‘now open’ filtering? We will have our own yes, it will show open/closed, and if we can it will be filter option also. Am I right thinkink that ? that’s definitely something we’ll work on after the release of V2. Which one would you like to see 1st? James took my thunder, so I will go to secondary question Will it be possible to take locations and “drill down” a listing for example if I have a group of “lemonade stands” on main street in Anytown USA can I search Main street within a zip code or other classification and pull up all lemonade stands in that area? isn’t that already how it works? I remember reading a forum thread about GD working to integrate an advertising facility. Will this be part of the initial v2 release? That’s a separate add-on. The Team is testing it internally as we speak. It’ll be out soon too. Migration paths for existing installs in place? They will be made available upon release of the beta. Will we still only be able to link GD CPTs to each other as opposed to linking a GD CPT to a non-GD CPT (for example like linking a GD Listing CPT to a WP Job Manager CPT). Looks like I better get up to speed with Gutenberg! Very forward thinking guys! These are some incredible changes, you folks! And Gutenberg support? Oh, well 💯 on that. You will be able to put almost any field in any content area like page description or widget area, with things like builders and Gutenberg it will be much easier.